Happy 4th everyone! I hope that you all are having a great time. In honor of the holiday, I am posting these great ideas for decorating with the red white and blue. 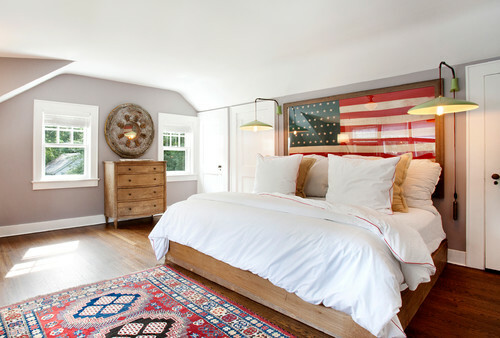 I hope that these patriotic room designs inspire you. Keep in mind that they do not need to be restricted to a holiday. These rooms and decor can hold their own all year through. So let’s get started! What better way to finish out a plaster or stucco bathroom wall than to add some color. 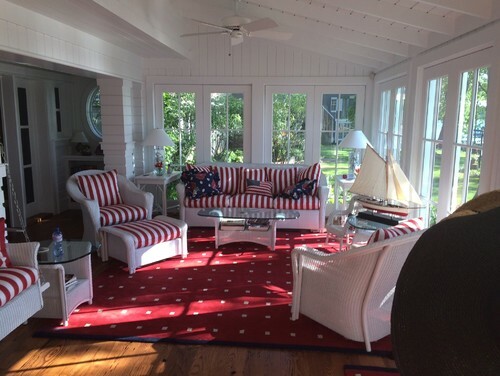 The bold colors are not only patriotic, but also really liven the space up. So, don’t be afraid to go bold. 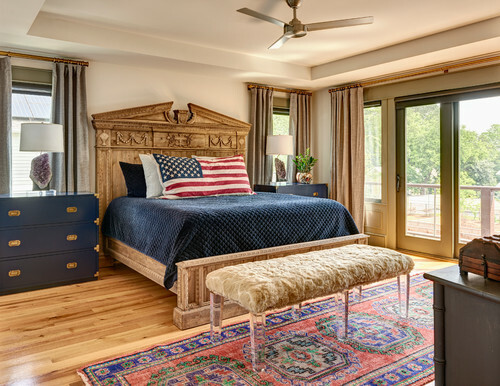 If, however, you prefer a more subtle design, this patriotic room theme is quite elegant. It also invokes a peaceful feeling. The wallpaper used in this design is from BorasTapeter, a wallpaper company located in Sweden. If your interested in this particular paper, you can find it in their Marstrand Collection. Red, white and blue works wonderfully for a boy’s room. These colors can be used to create a nautical theme or a baseball theme and still come across as patriotic. I love the use of these colors for little boys simple because of the versatility that they bring. Add a touch of patriotism to any room by the addition of a flag pillow. 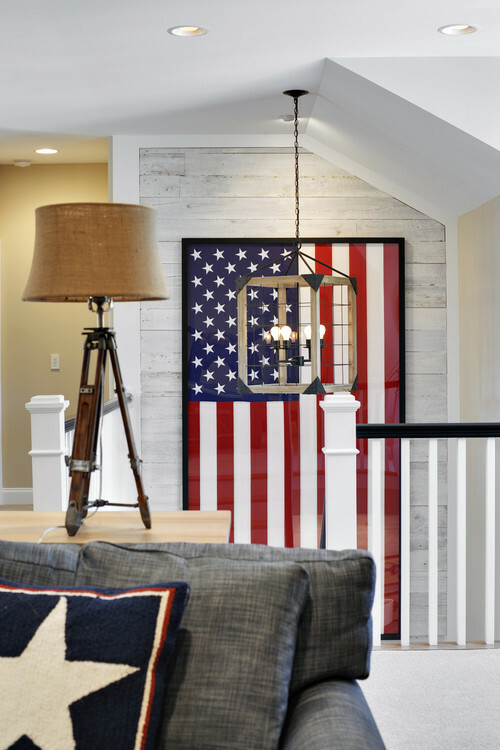 A room doesn’t have to scream your love of country to say it clearly. This kingsized pillow gets the message across while still maintaining a sophisticated look. If you love the look of a hanging flag, consider framing one and hanging it as a piece of art. They are great for areas where a large print is needed. Anyone that has needed something this large knows how hard it is to find something that works. So, a flag may be just the solution. Also consider hanging a flag vertically. Just as the previous image used a flag to cover a large wall space, a vertical flag can work in a tall space. Here a flag was framed and hung at a stair landing. (Note: remember that the proper way to hang an American flag is with the stars on top and to the left). I hope that you have found some inspiration within one of the above images. 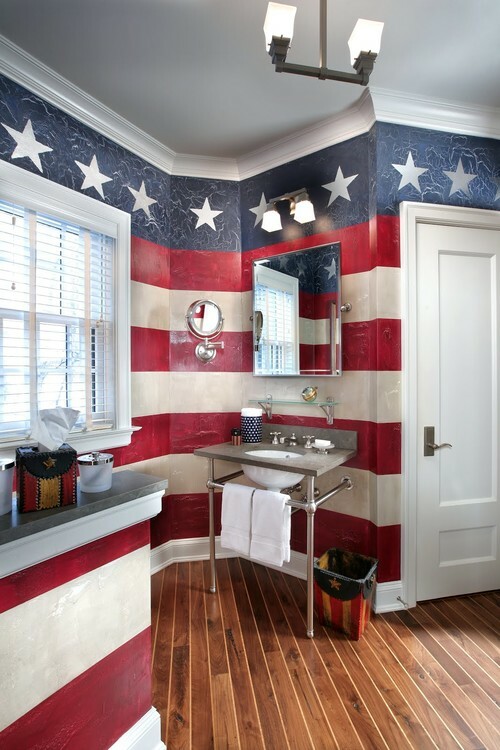 If you have any great ideas for patriotic room designs, please share them with the rest of us. Enjoy the rest of your 4th!